Trainer Bharath Singh`s top-weighted runner, Pothus (app. 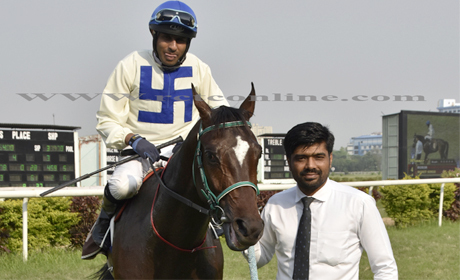 Rupal Singh-up) , scored a decisive victory over a fancied Mumbai-migrant, Gold Bond (C. Alford) to lift the 1,600m Captain Courageous Cup, the main attraction in the seven-event card, on Saturday, the penultimate fixture of the season. 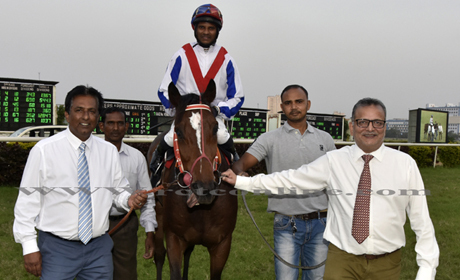 The afternoon also witnessed another of western India debutant, Perpetual Winning (A. Sandesh), a Javed Khan`s trainee, delivering the goods handsomely as a public choice. 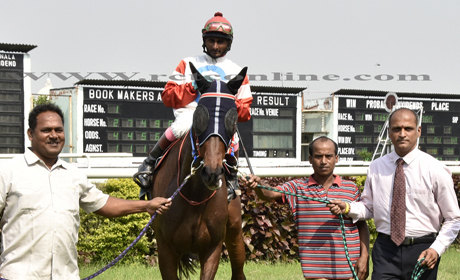 Sandesh finished the day on a high, having also partnered trainer Vijay Singh`s 4/1 shot, Duchamp, to an easy victory. Pothus spoiled Gold Bond`s party. The later, a 6/1 chance in the betting, looked like coming good, after shrugging off a dual challenge, first from the 5/2 favourite, Coup De Grace (Sandesh), followed it by Nelsons Blood but failed to stop the late finishing Pothus who was always in close attendance of Gold Bond, in the mid-bunch but displayed better acceleration in the final 100m of the race. Perpetual Winning, on the other hand, made his efforts simple. The four-year-old allowed Aquitania to test her hooves upfront till turning for home and chewed up the opposition. 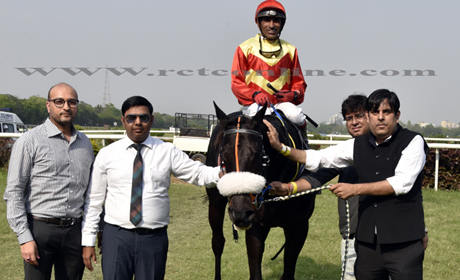 The Net Whizz son, therefore, fully justify his 14/10 odds as he won the 1,400m Fleet Indian Handicap by eight long lengths while Apna Time Ayega and Bang Bang claimed the minor slots. Trainer James McKeown`s baby, Manzoni (Hindu Singh) has been knocking at the door, and his last run against a very highly rated colt, Trafalgar, was quite impressive. It, therefore, hardly came as a surprise when the Multidiamensional-Five Satins son attracted tonnes of wagering at 12/10. 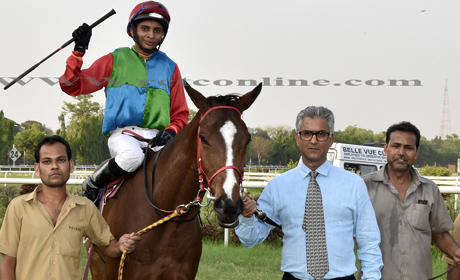 Trainer Jasbir Singh and jockey Mohit Singh, however, had other ideas as there charge, Roxor, who has also been knocking at the door, decided to put his best foot forward in the race. Manzoni got the better of the early leaders Adhira (Suraj Narredu) and Abenaki (C. Alford), a stable-mate of the favourite, when Roxor had just about made a steady improvement on the wide out at the home stretch. The final acceleration of Roxor proved too quick for the favourite and he lost without much of a contest as the rest of the field was simply out-classed. McKeown and Hindu Singh had, however, found the target early in the afternoon when their filly, Baglioni, made the 1,200m Scarlet Prince Handicap their own. A handy fifth or fourth till the final turn the filly by Top Class, an 8/1 shot, skated clear of the opposition in the final stretch to take the opposition by a complete surprise. Jasbir`s speedy Kefira (app. 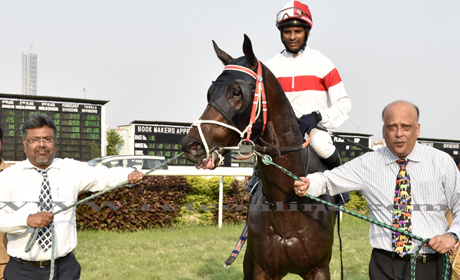 Rupal Singh) was however, no match for trainer Vikash Jaiswal`s Dancing Prince, who was the only other favourite to have obliged in the afternoon`s card. In the 1,100m Anzello Handicap, Kefira led till about 200m from home , before overtaken by the favourite, who was backed down from 5/2 to 11/10 and was, obviously a worthy winner to have justified wagering in the manner stated. 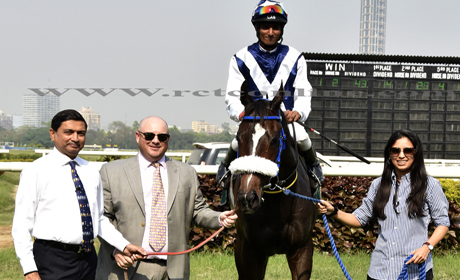 The curtain raiser and the concluding events – the Saddle Up Handicap and the Avaglow Handicap, both over 1,600m -- were claimed by Shyam Habbu`s Singapore Agatta (Shezad Khan) and Vijay Singh`s Duchamp (Sandesh), respectively. Each of the two has been knocking at the door and were 9/2 apiece, in open betting races.